SlimGenics Reviews - Is it a Scam or Legit? In business since 2003, SlimGenics offers four different personalized weight loss programs based on real-food nutrition, ongoing education, and motivational support. SlimGenics’ four-phase programs incorporate real, nutritious food, along with ongoing education and support, to help you quickly and easily lose weight based on your individual needs, as well as target all the underlying causes of your weight gain and set yourself up for ongoing success. Nutrition – Focuses on nutritious, delicious foods from all four food groups that are prepared at home, or that can even be ordered out at most restaurants. Education – SlimGenics Program Advisors use science-based resources to provide recommendations for a healthy, active life, as well as to teach you how to make healthy food choices that can help you lose weight and maintain results. Support – One-on-one visits with program advisors for all the support necessary to improve unhealthy behaviors that lead to weight gain. Healthy Living – Sleep and stress management, ongoing meal preparation, increase in activity levels, etc. While the website emphasizes that SlimGenics isn’t a quick-fix program, they point out that sticking with their programs can help you lose an average of one to two pounds per week, regardless of your age or how much weight you need to lose. You could also experience related benefits such as an improvement in body toxicity, “inflammation, digestive health, and weight­-related hormonal imbalances,” not to mention boosted overall health, confidence, and happiness. SlimGenics’ programs can also be customized for those with special medical or diabetic concerns, mothers who are nursing, those who have 100+ pounds to lose, and so forth. Together, this is why the program has been used successfully by tens of thousands of people. But is it your best path to good health and wellness? Let’s start by taking a look at the program’s fundamentals. How Does SlimGenics’ Four-Phase Weight Loss Approach Work? Note: As with any diet program, your results will vary based on factors like how much weight you want to lose, your age, gender, activity level, and general health. However, they guarantee you’ll lose weight, with or without exercise. All of this comes together via an integrated approach involving nutritionally balanced food plans, wellness and healthy lifestyle education, and personal support. This involves balanced, easy-to-follow nutritional plans that allow you choose from a variety of real, everyday foods available at the grocery and most restaurants. The program can accommodate specialized needs for vegetarians/vegans, food intolerances, and sensitivities. Using SlimGenics’ Integrated Food List, you’ll be able to “choose from a variety of proteins, starches, fruits, vegetables, and healthy fats and dairy,” learn how many servings to consume daily from each food group, and discover how to eat in balanced ratios. Their website features an array of breakfast, lunch, and dinner recipes to help you get an idea of what you might expect. In addition to your food plan, the company recommends eating a total of two to three Thermo-Snacks daily in between meals, which come in a variety of flavors, including “crunchy, savory or sweet snacks like bars, pretzels, puddings, shakes, and pasta.” This way, they indicate you can reduce hunger and cravings, stimulate your metabolism, and ensure you’re getting key amounts of protein. While there aren’t any restricted food groups in this program, some foods and beverages (e.g., cola) might be temporarily restricted during the weight loss phase, but can be added back once you achieve your goal. Finally, SlimGenics’ proprietary dietary supplement blends promise to “accelerate your weight loss, increase your energy, curb cravings, suppress appetite and reduce inflammation, as well as support detoxification and healthy organ function.” Your Program Advisor will make recommendations based on your individual symptoms and needs. At the beginning of your program, you’ll attend one short group meeting to obtain general information, set expectations, receive helpful tips, and ask questions. Note: SlimGenics recommends contacting a Personal Advisor at least three times per week, with a maximum of six times per week, to improve your chances for success. However, keep in mind that since there are no appointments, you’ll work with a variety of Advisors. Next, we’ll find out how this information is implemented in each of SlimGenics’ four programs. Which Programs Does SlimGenics Offer? If you live in Colorado, Minnesota, or Ohio, you can visit on of SlimGenics’ 24 local weight loss centers at your convenience for personal support from an Advisor. While there, they’ll “monitor your blood pressure, take your measurements, track your weight loss, and encourage you every step of the way.” You can be in and out in as little as 15 minutes. According to the website, this provides access to the same individualization as the in-office program, as well as the same “materials, structure, and accountability,” but from the comfort and privacy of your own home. Communication (again, up to six times per week) can be handled via phone or email. The SlimGenics Youth Program provides access to the same personalized support and healthy weight loss approach as the adult program, just tailored to the unique nutritional needs of pre-teens and teens ages 10 to 17 as they grow. This includes packing normal lunches and eating regular snacks, although modifications can be made based on your pediatrician’s recommendations. SlimGenics’ Workplace Program provides employees of partnered businesses with a 25 percent discount on the In-Center Program, which could help improve productivity, lower healthcare costs, and decrease absenteeism. And all of this without complicated paperwork or reimbursements. Could SlimGenics’ Programs Cause Side Effects? As with any weight loss program, you’ll want to consult with your doctor before beginning. They can help you choose an appropriate option based on your goals and diagnosis, as well avoid potential side effects and medication interactions. 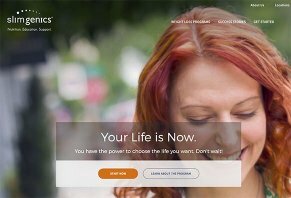 With this in mind, the SlimGenics website indicates that Personal Advisors will take your health history and current medication into account when developing your nutritional program. They can also work with your physician and provide updates along the way. Whether you’ve recently had bariatric surgery or have been previously diagnosed with diabetes, high blood pressure or cholesterol, arthritis, cancer, multiple sclerosis, or many other conditions, though, the company indicates their weight loss programs could work for you. In fact, they point out that losing weight could have a beneficial impact on conditions like these. How Much Does SlimGenics Cost & Where Can You Buy Their Products? However, the STEP @ Home program also comes with an initial $79 price tag. Most water-based drinks (including Thermo-Boost) cost $45, or about $1.50 per serving. The majority of Thermo-Snacks are priced at $17, making them between $2.42 and $3.40 and per serving. Supplements tended to fall somewhere between $42 and $259. We also found many of these products sold on Amazon for about the same prices. Note: While Prime members might be able to save on S&H by ordering through Amazon, it doesn’t appear these purchases are eligible for the SlimGenics Rewards Program. A customer support representative can be reached at 855-843-1200. What Can We Learn From SlimGenics Customer Reviews? On their website, nearly all customers had given SlimGenics four or five-star ratings, frequently citing effective results, great support staff, and the ability to maintain results. On Yelp, their various centers had between one and five-star customer reviews, which was much of the same when it came to their individual products on Amazon. While we didn’t try any of the SlimGenics programs ourselves or visit a center, we called and spoke with a friendly local representative who advised that Personal Advisors aren’t required to have a specific degree or area of specialization, although they emphasized that most tend to have some experience in nutrition or a related field. Furthermore, they advised all Personal Trainers undergo intense corporate training, some of it lasting up to six weeks. Along these same lines, based on some of the feedback (both good and bad) we encountered on GlassDoor.com, SlimGenics is a very sales-centric company. Specifically, more than one former employee emphasized that the job primarily involves selling supplements and food products to clients. From a company perspective, SlimGenics, LLC is based out of Arvada, CO and has been in business 2003. They held an A+ Better Business Bureau rating, based on two negative customer reviews and eight closed complaints, as of 4/3/18. Most referenced support concerns, although a company representative responded in each instance. Are There Other Weight Loss Programs Like SlimGenics? According to IBIS Services, the weight loss services industry garners about $2 billion annually, assisting the more than one in three adults who are classified as obese. How can you decide which of these options—whether SlimGenics or a third party—is going to deliver the most weight loss for the money? Not to sound like a broken record, but like with any new weight loss program, the National Institutes of Health emphasizes that you should start by talking with your doctor. If you have questions, you can prepare them ahead of time, along with a list of other medications and dietary supplements you’re taking. Based on your current level of health and overall diagnosis, they can recommend specific approaches that might maximize the likelihood of achieving your goal. Next, it’s important to maintain realistic expectations. This is because most of these programs promise results in the one to two-pound per week range, which is what the Centers for Disease Control and Prevention reports is considered healthy weight loss—and what you could achieve through a healthy diet and exercise on your own. Finally, something that even many SlimGenics customers emphasized in their reviews is that, while their educational material could help provide the information you need, and their Personal Advisors could deliver the support you want, it's up to you to stick with the program. As such, it might be better to wait until you're ready to stick with it before making a financial commitment. Weight loss is a complicated topic, as everyone’s body is different, not to mention the fact that we all have a variety of needs and personal preferences. In other words, what works perfectly for one person might not work at all for another. With this said, while the basics behind losing weight and maintaining results over the long term are fairly simple (eat fewer calories than you consume and exercise regularly), actually achieving this in the real world can be a daunting task. For this reason alone, commercial programs like SlimGenics could provide a great deal of structure, motivation, and accountability that might hold the key to your success. And based on the mostly positive online customer feedback for the company and their products, it seems like these factors are delivering results for most. Again, just keep in mind that you should talk with your doctor first. During your visit, be sure to talk with them about whether or not SlimGenics’ dietary supplements will deliver a solid level of value—especially if you’re not deficient in any of the ingredients they contain. Write a Review for SlimGenics!